CERT is a positive and realistic approach to emergency and disaster situations. CERT is about readiness, people helping people, rescuer safety, and doing the greatest good for the greatest number. 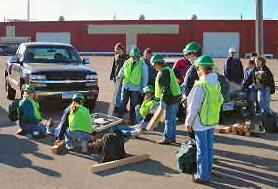 CERT educates volunteers about disaster preparedness and trains them in basic emergency and disaster response skills. CERT members can help take a more active role in preparing their communities for disasters. CERT members can assist others in their neighborhoods or workplace following an emergency. CERT will teach you how to disconnect utilities and put out small fires; treat the three killers by opening airways, controlling bleeding, and treating for shock; provide basic medical aid; search for and rescue victims safely; and organize themselves and spontaneous volunteers to be effective. Brown County’s CERT program is a 20 hour course, consisting of both classroom instruction and hands-on practical drills. The class is open to any person 12 years of age or older. Brown County also has taken the CERT program to the next level. We have currently 5 teams in place to respond to disaster situations in and around our communities. These teams receive further training to provide additional assistance to professional responders in time of need, and have proven themselves to be a very valuable asset. Currently Brown County has 368 people thru the CERT program with 100 members on county teams. If a disaster happens that overwhelms local response capability, CERT members can apply the training learned in the classroom and during exercises to give critical support to their family, loved ones, neighbors or associates in their immediate area until help arrives. When help does arrive, CERT’s provide useful information to responders and support their efforts, as directed, at the disaster site. CERT members can also assist with non-emergency projects that improve the safety of the community. CERT’s have been used to distribute and/or install smoke alarms, replace smoke alarm batteries in the home of elderly, distribute disaster education material, provide services at special events, such as parades, sporting events, concerts and more. for the next CERT class!